Testimonials and references are a great way to get a feel for the company that you are considering to hire. Once mutual interviews have been completed, Blue Valley Remodeling, Inc. will present you with real references that you can speak with and, in some cases, actually see the completed projects. Don't simply rely on printed customer remarks. Do your homework and check to make sure that your general contractor is fully licensed to perform all the work proposed, check references and make sure that your professional is fully insured and willing to provide you with all of the necessary lien release paperwork. "Our new kitchen brings smiles to our faces every morning, noon, and evening. The only thing we regret is having waited so long to do this! Everybody we worked with was top-notch professional. Ron not only helped us with the design and selection of cabinets, granite countertops, backsplash, and appliances, but he met us at various shops where we could view and select, if we so chose, from many alternatives. Ramona's crew was able to match our 50 year-old oak floors in adjacent rooms with the new floor. The dimmable lighting provides a warm, romantic feeling in the evening. And, the job came in under budget." 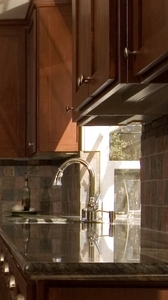 "Blue Valley Remodeling was a great company to work with. We interviewed 4 kitchen contractors for our complete kitchen remodel and Blue Valley was the most responsive and interested. Our personalities meshed very will with the owner. We checked all of his references and they were strong recommendations. Our remodel cost approximately $20,000 and took 4 work weeks to complete from beginning of demolition to the the point we could move back in. Blue Valley came in under budget and on schedule. They were very honest and trustworthy. As with any contractor, you will need to stay on top of them so they know you mean business. Written contracts and clear communication are also strongly recommended by my experience." "We woke up to discover a dishwasher leak that had saturated our cabinets and hardwood floors...we notified our insurance company and Blue Valley Remodeling...it was a great experience. We felt confident because Ron and the insurance adjuster spoke the same language and we knew that Blue Valley was our advocate...our outcome was the best scenario and we love our new kitchen! I have recommended Blue Valley with confidence over and over!"